Today I wore two necklaces. I have been avoiding this as I really want to stretch out my favorites but I had a big day planned and I really needed to feel comfortable and suitably adorned. 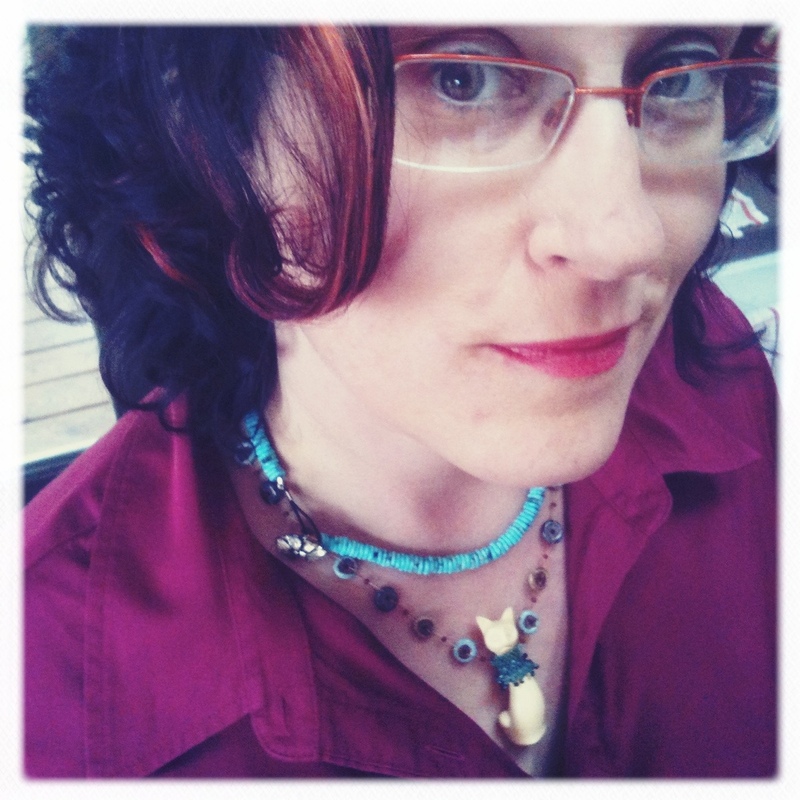 I wore these necklaces with a raspberry-colored shirtdress and olive green platform shoes. It’s kind of an odd combination but the dress seems put together and crisp, and the shoes are a bit funky. Seeing as how I have orange stripes in my black hair a vibrant color combo shouldn’t be completely unexpected now and then. The shorter necklace was a gift from my friend Joan. The turquoise discs are very good quality, clear blue American turquoise. The vintage button clasps the beads and can be worn front or back. 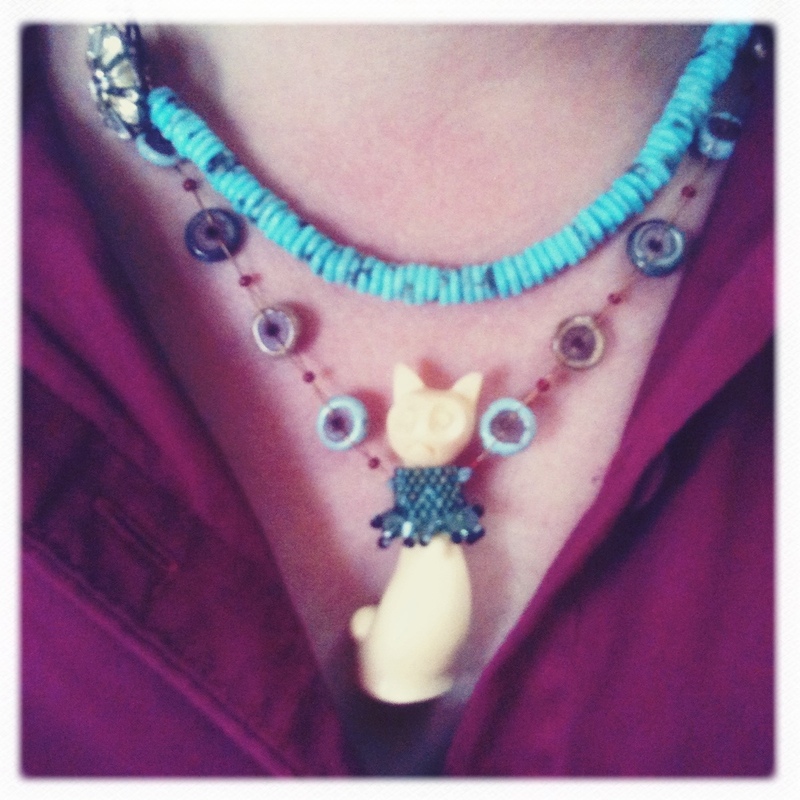 The longer necklace features a vintage carved cat made into a pendant by Susan Reynolds of Bijoux Savvy. She created a tiny, sparkly beaded collar for the kitty. The sides of the necklace are made with Elaine Ray small washer beads strung sideways with gold-colored SoftFlex and dark raspberry-red Toho seed beads. The necklace is finished with leather cording and a brass clasp. I didn’t realize how often I layer necklaces until I started this blog. Almost every day I want to add a second or third necklace but I haven’t until now. It’s funny, I almost never make multi-strand necklaces.